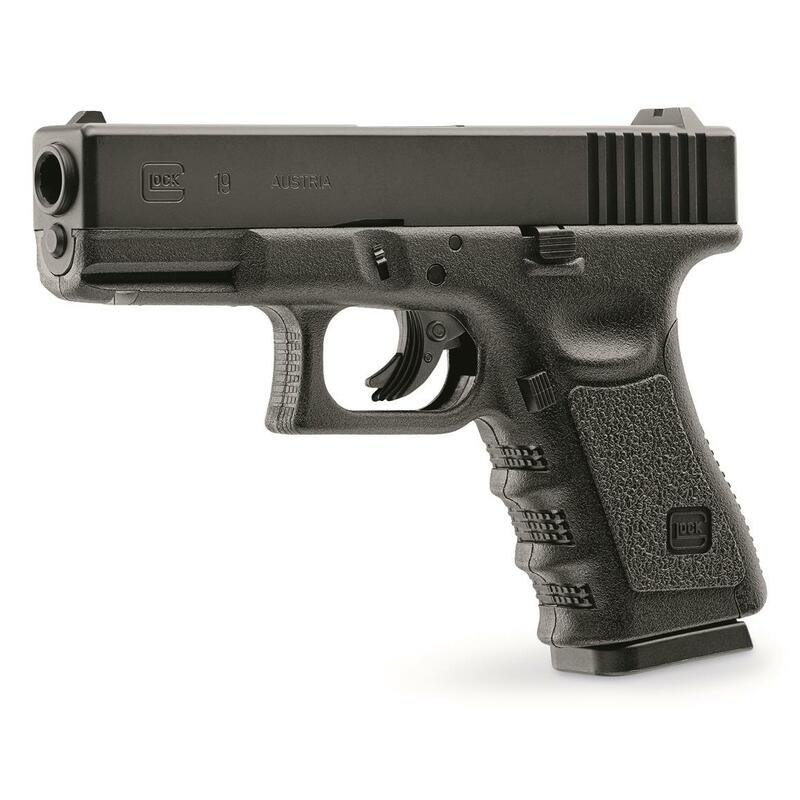 The FIRST-EVER fully licensed Glock® Air Pistol. Built using exact Glock® specifications, the Umarex® Glock® 19 CO2 Airgun is a true-to-life replica that's great for training exercises or popping pests in the backyard. 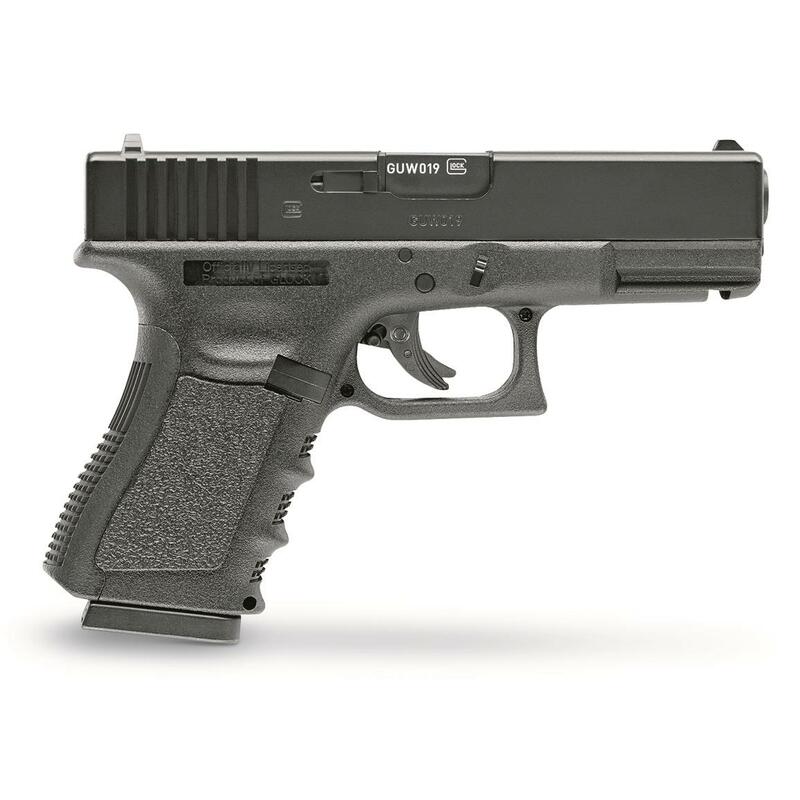 It features fixed Glock®-style sights and a CO2 power plant that puts you on the mark with 410 FPS muzzle velocity. That's more than enough knockdown power to take out cans and annoying vermin. Plus, it even has an integrated Weaver® rail for adding lasers, lights, or other tactical accessories. Umarex Glock 19 CO2 Airgun, .177 Caliber is rated 4.9 out of 5 by 14. Rated 4 out of 5 by SAMC from Awesome option for leaning trigger control and practicing your draw. This is an awesome option for leaning trigger control and practicing your draw. The only issue that I have with it is that it the slide is slightly wider than an actually Glock 19 slide so it doesn't fit any of my holster. Rated 5 out of 5 by bderf from Buy it! Gun is weighted well because of the metal slide which does not move. This allows the gun to stay on target better when shooting. Rated 5 out of 5 by BriGuy from Accurately weighted. And accurate.... at 36'!! 4 mags into it on the first CO2 cylinder, I step back from 20' to try and gauge BB drop. I hit all in a 3 1/2" spread. At 36' the dot and circle I drew was sort of hard to see! This is great, cheap fun!! 36' is about the most I can walk off indoors as it's dark out. Rated 5 out of 5 by MCRD146 from Nice replica Looks & feels like the real pistol. Good trigger. Well made. Good accuracy for a bb pistol. Rated 5 out of 5 by Mustangkev918 from Love it This Glock 19 BB gun looks and feels like the real thing, love it, one downside is the slide is fixed, so it doesn’t move, but other than that it’s great!